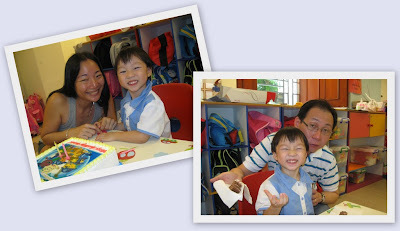 We celebrated Baby G's 3rd birthday at his school. We already told the teachers so they were well prepared for our arrival. First thing we saw was that the children were all seated around the tables while Baby G was seated in the centre of the class, waiting expectantly for us. He was very excited to see us in school. We quickly whipped out the Barney cake & arranged the candles. You really have to be fast when you have 25 kids gearing up to eat the cake. 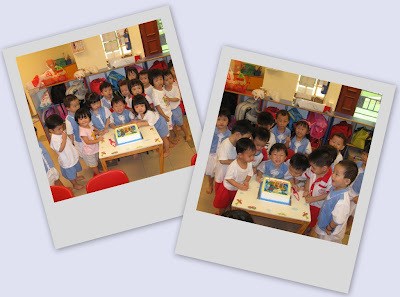 The teachers had to keep the kids from coming over to touch the cake. We managed to take some shots just before the cake disappeared. We wanted to give the kids something special besides the party favours that I prepared. Daddy decided to take a class photo and give the photo to each of the children. But because the children were all so excited, it was difficult to line them up for a shot, so we had to split them into 2 groups. 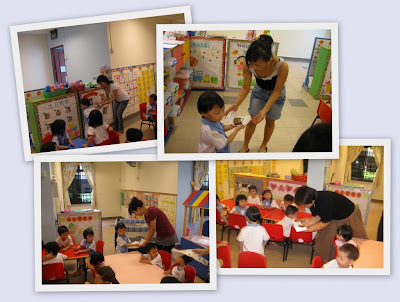 After much help from the teachers, Daddy managed to get some shots for the kids to take home. These are the 2 shots that we selected to give the kids. Baby G served the cake to all his teachers before finally getting one piece for himself. What a polite & considerate boy. Heh Heh. Baby G serving all his teachers. Happy birthday Gabriel! Stay cheeky & cheery always! Thanks to the Tan family for the birthday wishes!